(Aaron Kesel) For four years, the mainstream media has accused Edward Snowden of being a foreign spy due to the unknown nature of where Snowden spent his first 11 days in Hong Kong. Those rumors have been put to rest today by Intercept journalist Glenn Greenwald, who obtained documents debunking the conspiracy. 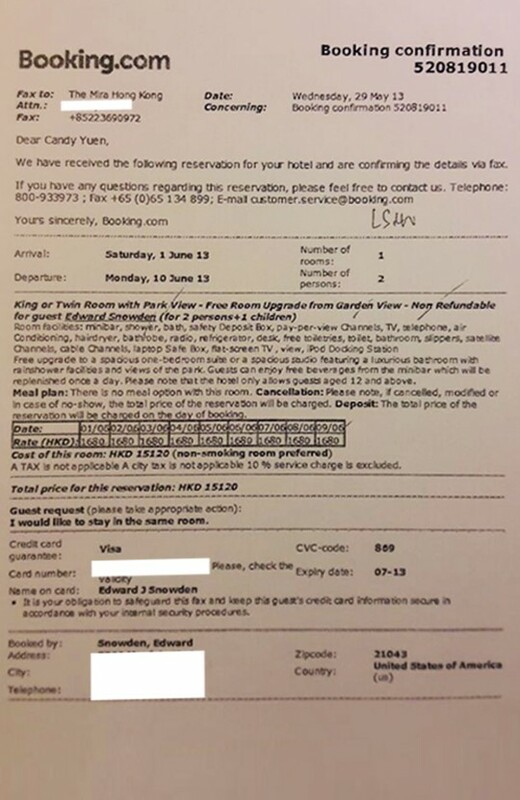 “They insist that contrary to what Snowden had asserted, he did not check into the Mira Hotel on May 21, 2013, the day after he arrived in Hong Kong. 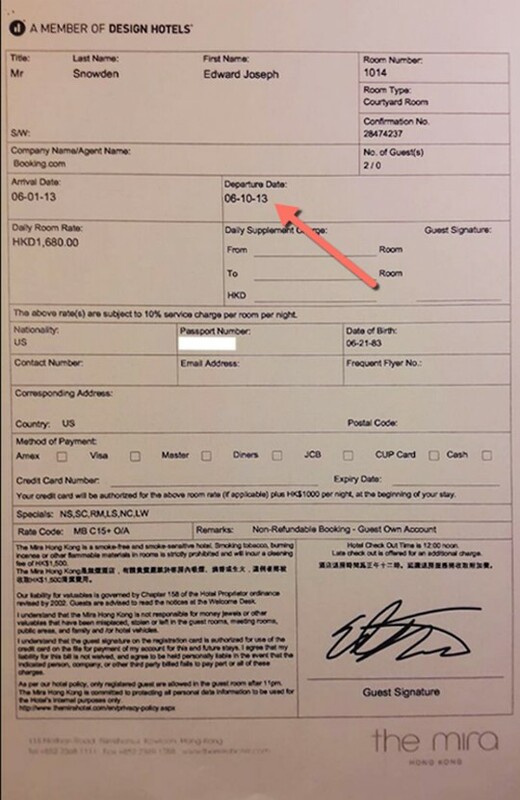 Instead, they assert that he checked-in on June 1, which means Snowden has 11 “unaccounted-for” days from the time he arrived in Hong Kong. This was all before he met with journalists at the Mira in the beginning of June,” Greenwald writes. These missing “11 days” has spawned frivolous baseless conspiracy theories. Many mainstream pundits have said that this is proof that Snowden was working for a foreign government either Russia or China. Obama’s own acting CIA Director Michael Morell even denied the ridiculous claims that Snowden was working for foreign intelligence in 2015. “My own view on this question is that both Chinese and Russian intelligence officers undoubtedly pitched him — offering him millions of dollars to share the documents he had stolen and to answer any questions they had about the NSA and CIA. But my guess is that Snowden said, “No, thank you,” given his mind-set and his clear dislike for intelligence services of any stripe,” Morell said to the Daily Beast. 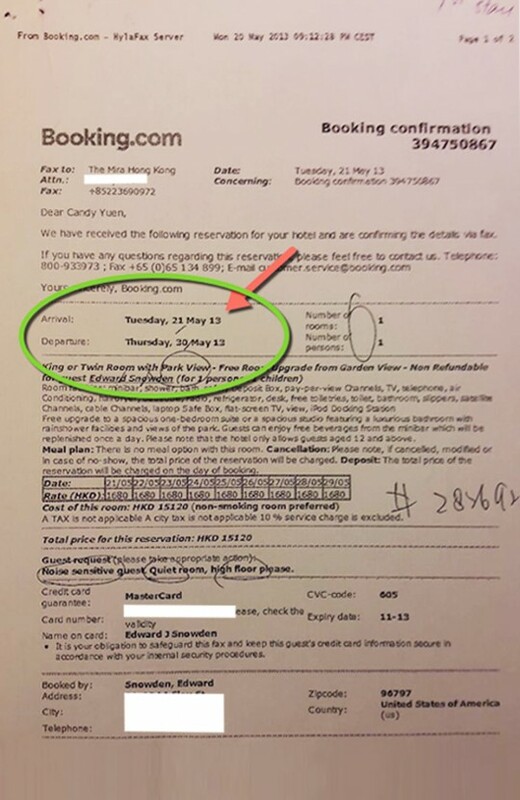 Several documents provided by the Mira Hotel and Booking.com to Snowden’s lawyers in Hong Kong prove that Snowden has always told the truth that he checked into the hotel on May 21st. 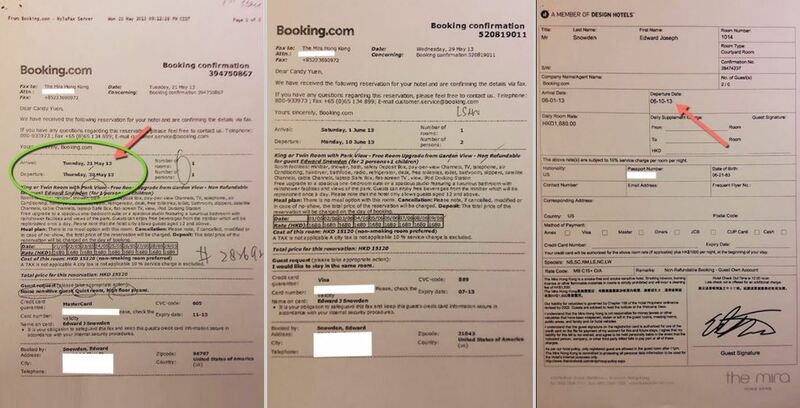 The first two documents show that Snowden checked in on May 21st and booked the hotel, the last document shows that Snowden accumulated $2,700 in fees for his original one day stay at the hotel from May 20th-21st which he later extended twice until June 10th when he left for Moscow. These documents conclusively prove that it’s a false accusation that Snowden did not check into the Mira prior to June 1, and that the missing 11 days never happened. The story which apparently was started by Edward Jay Epstein of the WSJ on the grounds that an anonymous official told him that “U.S. 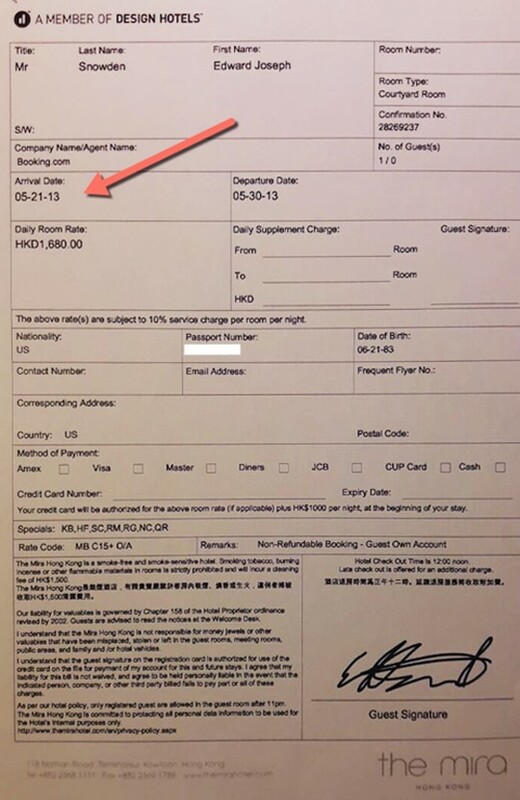 investigative agencies have been unable to find any credit-card charges or hotel records indicating his whereabouts” given that the hotel records and credit cards were all in Snowden’s name,” Greenwald writes. Greenwald then goes on to expose the problem with journalism now-a-days: blind belief in a claim without any further investigation by others. Just parroting what another “well respected” establishment figure said, or reading a government funded pre-packaged news without discernment. You can read Greenwald’s full explosive expose of the missing eleven days here on the Intercept.